For the first time, Dunkin’ Donuts is using Twitter as the initial vehicle for a product launch. Earlier this week, Dunkin’ ran a“Mocha MaDDness Twitter Sweepstakes” to pre-promote its new Mocha K-Cup packs, which will be available for purchase for a limited time starting in June, at Dunkin’ restaurant locations. 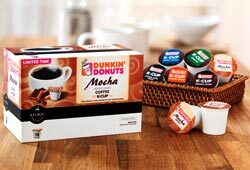 The sweeps is Dunkin’s way of rewarding loyal fans by alerting them to the new product in advance of its availability in Dunkin’ locations, as well as giving them a chance to win free samples. As of early May 25, Dunkin’ had about 145,936 Twitter followers. The power of Twitter is not new to the national donut shop. Popular campaigns likes the Iced Tea TuesDDays Sweepstakes as well as the #DDSMARTY Contest have been very successful. After a national product launch like this one, do you think Twitter will become the new vehicle for all types of launches? Let us know! Previous Post Public Relations, an Adventure Abroad.